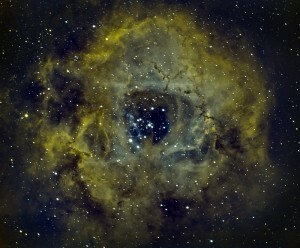 Arg… it’s been a long time since I attempted to image, but Dave and I made it out last night for a few hours. 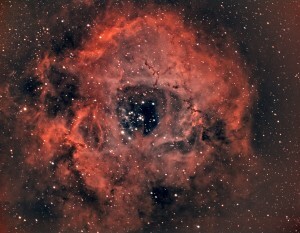 We discussed attempting the Rosette Nebula since neither of us had ever tried to image that target before. It seemed to be up for a reasonable window and bright enough for us to get some data from the yellow-ish/green zone at Tranquility Base. Dave continues to have camera control issues from his computer and I feel bad that I can’t be of more help due to my ignorance around the Nikon platform. He ended up shooting M81 and M82 unguided using a handheld intervalometer (off-body shutter trigger with an interval timer built in) and it worked quite well. I started out shooting with a hydrogen-alpha filter because the moon was quite bright. I think we are less than a week from it being full at this point. I didn’t think I’d have enough time to get sufficient RGB subs, so I had to make the call to either hoard a bunch more Ha data the rest of the imaging window or attempt a bi-color rendition of the target. I’m pretty new to narrowband integration and haven’t done much of anything using synthetic palettes other than perhaps the North American wide-field last year, so I switched to shooting Oxygen III until the nebula was obscured by Loblolly pine tree tops. I lost a handful of subs due to clouds and another handful of subs due to silly mistakes that I blame on a quarter year hiatus… like not meridian flipping before tracking fell off a cliff. At any rate, this image represents 46 sub-frames at 300s each (28 Ha and 18 OIII). I used a previous master suber-bias and master dark that I had in the library. I don’t know if the master dark temperature compensation was the same, but whatever (FWIW, this was shot at -5C). I wanted to process this in SHO Hubble Palette, but honestly couldn’t remember how to do it, so I just went with a natural synthetic green channel using a 10/90 PixelMath blend of the Ha and OIII channels. The original Ha stack had far better signal to noise due to the greater number of subs and stronger Ha emission, so I used it for the Luminance rather than extracting Lum from the blended RGB. All of the registration, calibration, and integration was done in PI and then I just used PS CC for re-sizing for the web. This turned out to be a lot more interesting target than I anticipated and would really love to spend some time accumulating more (deeper) frames and try different processing techniques. Cheers!